Test Valley Borough Council: Pure Town Planning recently successfully obtained a certificate of lawfulness for clients in the countryside near Andover to confirm that the integration of their former paddock into the garden was lawful and they can carry on using the whole as a larger garden. How do you turn a paddock into a garden? The extension of residential gardens into agricultural or other non-residential land in the countryside is the subject of many a failed planning application. It is a big no-no in planning policy for residential use to encroach into the open countryside in this way (not least because a domestic curtilage brings with it significant development potential under permitted development rights). 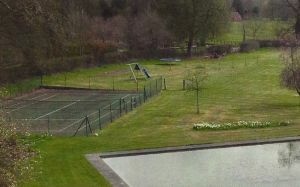 However it is not uncommon for homeowners to quietly incorporate some land without seeking planning consent – often there is no ill-intent they just don’t realise that they are technically making a material change of use of the land if they begin closely mowing the paddock, plant some shrubs and put out children’s play equipment. If they can make the material change of use and keep using it for ten years unchallenged then it can become lawful and the Council cannot take any action against it. Then the situation can be confirmed with a Certificate of Lawful Use – a useful tool in cementing the higher land value. But it is not straightforward making such applications and there are plenty of pitfalls not least proving that the change of use happened ten years ago and has been constant since – it is usual for these things to progress gradually over time making it hard to agree when it actually started. In this case there were additional issues such as the original house being damaged in a fire and replaced during the ten-year period. In this case we were able to put together adequate evidence to convince Test Valley Borough Council that the use was lawful and that the certificate had to be issued. Our role also involved seeing off the counter claims of various neighbours and local residents. If you have a breach of planning control which you think may have become lawful or if you have any other concerns about unauthorised development then you can talk to us for impartial advice in the strictest confidence.